Google Fined $1.7 Billion By EU Over 'Abusive' Online Ad Strategies For years, AdSense contracts gave Google a wide range of control, including how its rivals' search ads would appear — and their size, color and font, the EU says. 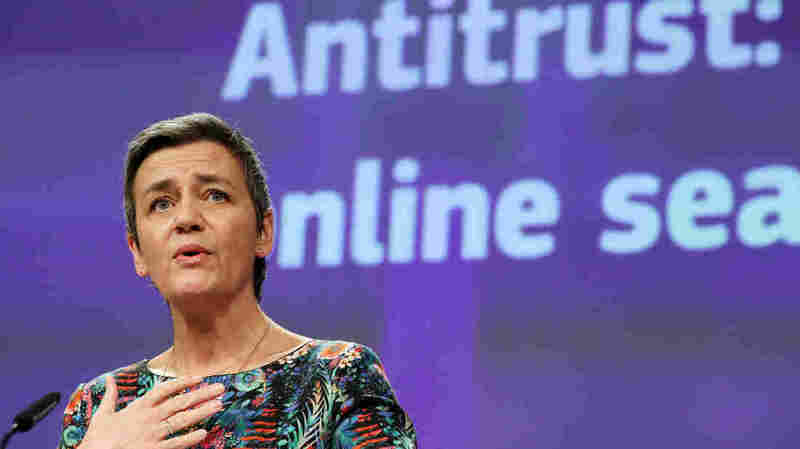 European Commissioner for Competition Margrethe Vestager says Google broke the law for roughly 10 years by restricting how business partners deal with rivals in search advertising. The conditions evolved over time, from exclusivity clauses in 2006 to "relaxed exclusivity" in later years. But the practice still damaged competition, European regulators said, noting that later requirements let Google control how its rivals' search ads would appear — including the size, color and font they used. "This is illegal under EU antitrust rules," said EU Commissioner Margrethe Vestager, who is in charge of competition policy. "The misconduct lasted over 10 years and denied other companies the possibility to compete on the merits and to innovate — and consumers the benefits of competition." She added that in addition to the fine, the ruling means "anyone who has suffered damage because of Google's behavior can also claim compensation from Google through national courts." This is illegal under #EUantitrust rules. Google stopped using the exclusive contract clauses in 2016, when the EU objected to them. This week, the company says it agrees with the commission's belief that healthy markets have wide benefits. "We've always agreed that healthy, thriving markets are in everyone's interest. We've already made a wide range of changes to our products to address the Commission's concerns," said Kent Walker, Google's senior vice president of Global Affairs. "Over the next few months, we'll be making further updates to give more visibility to rivals in Europe." It's the third multibillion-dollar penalty the EU has recently laid on Google. Last summer, the European Commission issued a $5 billion antitrust fine for forcing Android phone-makers to install the Google search app and the Chrome Web browser. In levying the latest fine, the EU noted that the roughly $1.7 billion represents "1.29 percent of Google's turnover in 2018." It adds that the fine was calculated based on Google's search revenues in the EU market. As for what the EU will do with the $1.7 billion it gets from Google, the commission says the fine will lower member nations' contributions to its budget.